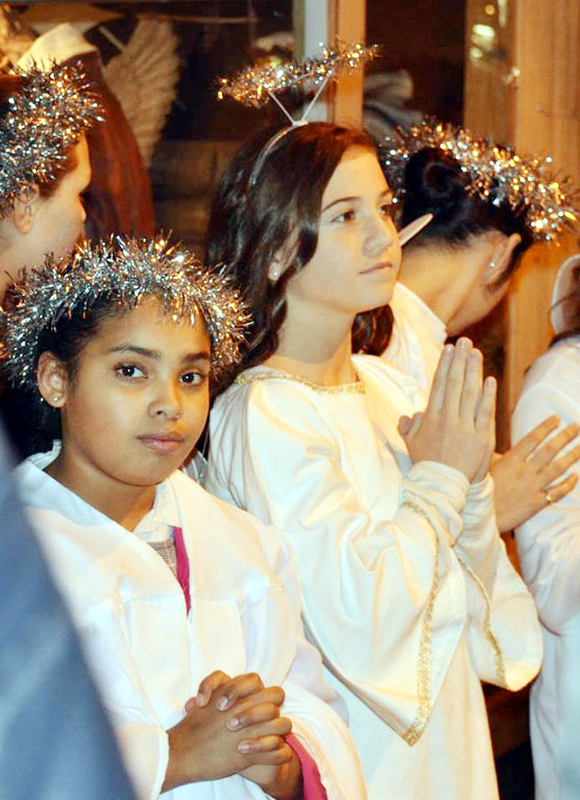 Blessed Trinity Regional Catholic School in the Mayfair section of Philadelphia ushered in the Advent season through a live manger scene, adjacent to St. Timothy Convent on Levick Street, the evening of Dec. 4. 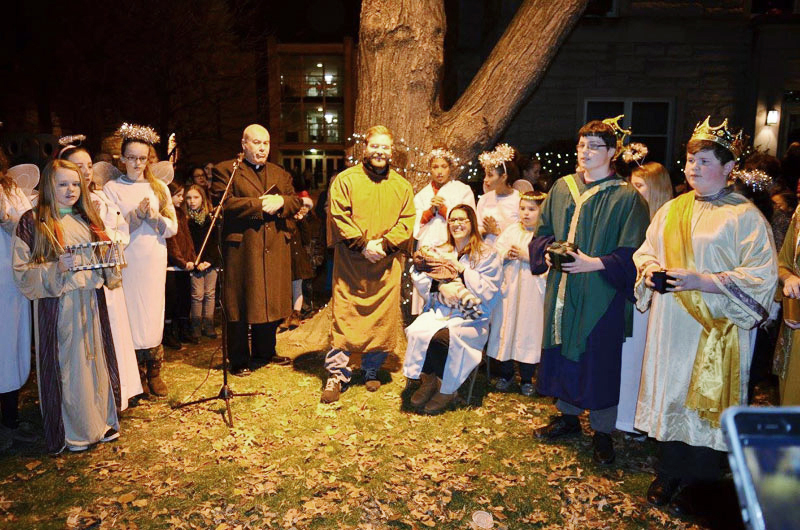 Stars of the second annual event were, of course, the Holy Family; backed up by a heavenly choir of angels, shepherds, kings and assorted animals. The ox had the night off, and the camels were represented by a distant cousin, a friendly llama; also present was a faithful donkey along with a goat and a couple varieties of sheep. “We celebrate that fact that God loves us so much that he sent his only Son to us as our Savior,” said Father Michael Olivere, pastor of St. Timothy, at the opening blessing ceremony, before reading the traditional Birth narrative from the Gospel according to Luke. Tiny Baby Jesus, a.k.a. Nicholas Zimmaro, in the arms of his parents Mary and Joseph, a.k.a. parishioners Katrina and Nick, was quite unperturbed despite the throng of well-wishers on hand to greet him. As to how it feels to be the surrogate guardian of Jesus, “It feels very holy, I’m honored,” Nick said. The celebration continued afterward in the nearby school hall with music, refreshments, entertainment and naturally a visit from another Nicholas – Santa Claus, on a Christmas practice run.